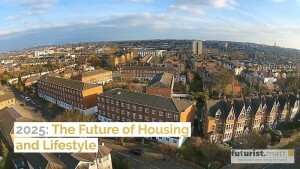 The Future of Housing and Lifestyle will affect us all and is particularly pertinent to me as I'm currently working with a housing association to help them explore future strategies. By today's standards, there are some radical approaches being considered in housing that could overcome the lack of land in urban areas: Super-skyscrapers and earth-scrapers, underwater habitats. Also the Blue Origin Moon & Mars One colonies. Given the 'Life in 2025' theme, we'll explore the near future rather than further ahead. Before exploring the technological opportunities available for housebuilding, it's important to recognise the real challenge we have in the UK - a lack of available land. In truth, there's plenty of land to build on, it's more a challenge that government regulates that land combined with the influence of special interest groups. Couple these challenges with the fact that the British government wants 300,000 new homes per year leading to 2025, and we have a problem on our hands. Special thanks to James Woudhuysen for permission to produce this short animation using one of his presentations. It aims to show how just how restrictive land use practices in the UK truly are. "We need to build on the Green Belt, and tear up the state’s monopoly on the right to develop land. We need to critique house-builders not just for their rapaciousness, but for their low volumes, craft methods and eco-posturing. We need to end labour-intensiveness, poor pay and low productivity in construction. We need to mass-manufacture cheaper, more spacious, daringly designed, flexible and fully IT-capable homes. In short, we need to deregulate land, bring the cost down and use precision robots to build new, personalised homes." Professor James Woudhuysen, Why they can't fix the housing crisis. Strong points, well made. Whether we're replacing existing housing stock or building on new land, options abound for progressive housebuilders. 'It's as easy as building with lego'. Perhaps not quite that easy, but as usual, China shows us how it's done. Back in 2016, they showed us how to construct a 57 storey building in just 19 days. Indeed, 90% of the building process was handled in a factory on large production lines. Closer to home, insurance company Legal and General has been leading the way with a promise to build 3000 new modular homes per year. It's also encouraging to see Housing Associations get in on the action too. Essex based Swan Housing delivered their first modular home in Basildon back in October 2017. Additive printing technology has come a long way since its inception in the 1980s. So much so, Russian startup, Apis Cor demonstrated in 2017 their capability to 'build' a house in just 24 hours. There is understandable debate across the Architectural community as to whether the hype surrounding 3D printed buildings meets reality. Current construction methods include scores of different processes. Can the simplistic single process of additive printing truly replace the reliability of cast-and-pour concrete, spot welded steel and laminated glass? Dubai claims it can, with ambitions to 3D print 25% of its buildings by 2030. Perhaps they will: they've already shown us they can meet hype with engineering reality through both the Palm Islands and the tallest building in the world, Burj Khalifa. Could Digital Twin buildings reduce some of the day-to-day tedium faced by facilities managers around the world? The idea is that physical buildings have a 1:1 digital 'virtual building' twin. These represent every construction, infrastructure and design aspect of the physical structure. Unlike traditional static 3D models, these twins capture information being generated by the building in real-time. As AI continues to develop, it could make continuous adjustments and control specific features such as security cameras, temperature and lifts. Gartner predicts that by 2021, half of large industrial companies will employ Digital Twins, resulting in a 10% improvement in business effectiveness. While Digital Twins mainly apply to commercial buildings right now, keep your eyes peeled for how homes of the future integrate with our digital assistants and IoT technlogies. Amazon already refers to the output of IoT devices in our homes as Device Shadowing. A practical example of digital twins in our homes: IoT technologies will detect an abnormally cold summer's evening and automatically adjust the heating to compensate. On the road to creating the physical buildings that spawn digital twins is Building Information Management (BIM). The construction phase only begins once all the stakeholders' expectations are met virtually first. BIM is a related trend to watch. Impact of China on UK Housebuilding? China is the largest building construction market in the world, with up to 2 billion square meters constructed annually. This accounts for nearly half of new construction globally planned to 2027. You might wonder why this matters for UK housebuilders. Two reasons: scale and international ambition. Following the Sichuan Province earthquake in 2008, the Chinese government embarked on a massive rebuilding programme. "About 250,000 temporary houses were built within a month; 1 million within 2½ months. As of November 2008, more than 200,000 homes had been rebuilt, 685,000 were under reconstruction." While its long-term effectiveness is debated, it's indicative of how the Chinese mobilise to get stuff done. 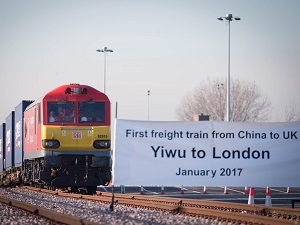 Add in China's 'Belt and Road' initiative, they already have ambitions for the UK prefab housing market. Perhaps we'll see more materials 'grown' rather than outright extracted. New York based artist, David Benjamin, created MoMa PS1. It's an art gallery composed of bricks made from mycelium (the vegetative element of mushrooms) and corn husks (a waste product from food). If produced carefully, these bricks are carbon neutral, entirely the opposite of conventional building materials. Mycelium isn't just an artistic curiosity either. A growing number of parties are exploring the practicalities of using it in commercial property. The challenge with unconventional technologies is often whether public perception allows for them or not. Mycelium has potential with existing materials too. Cracks in concrete structures such as bridges can be extremely expensive to repair. In answer to the problem, researchers from Binghamton University have been working on self-healing fungi to grow into concrete micro cracks to repair existing infrastructure before it becomes a serious issue. For further reading on materials science and the future of building materials, take a look at this article. One example that fascinates me is 'Super Wood', which claims to be 12 times stronger and 10 times tougher than its natural counterpart. Solar is often touted as a miracle solution to our energy needs as it has the potential to facilitate less reliance on electricity networks which are still very much dependent on fossil fuels. Solar is a long term investment. Between 1977 - 2013, the price of photovoltaic cells dropped by a factor of 100. Bloomberg forecast that even without any further technological breakthroughs, the price of panels is set to drop from £0.48/watt in 2015 to £0.16 in 2040. Not only is the cost of generating power decreasing, so is increasing legislative pressure. In the US, the majority of new homes in California will mandate solar energy installations by 2020. Back in the UK, around 20% of UK power requirements during summer come from Solar. The challenge is a decrease in subsidy which increases the time for investments to pay back. That said, battery technology for storing power continues to improve, alongside the promise of Photovoltaic paint which could increase the surface area of our homes for power generation without the perceived blight of ugly looking panels fixed to our roofs and in gardens. Get ready for self-sustaining greenhouses which provide their own energy for growing plants and food too. Could Robots assist us with housebuilding? Following successful testing in the US, expect to see 'SAM' the bricklaying robot on UK construction sites. It doesn't automate the process but instead augments a human mason. A good bricklayer could expect to put down 500 bricks per day. 'Sam' works six times faster, laying nearly 3,000 in the same period. Regardless of whether SAM starts taking jobs, the fact remains we need it. The UK construction industry struggles to find talent and the challenge is set to escalate when 400,000 workers are expected to retire by 2023. I've barely scratched the surface in this article. Modular skyscrapers comprising 'plug and play' micro apartments, self repairing homes, zero waste homes where the ultimate goal is 100% sustainability with no carbon footprint are all technologically possible. Indeed, many of the endeavours described in this article are to be encouraged. But, as Professor Woudhuysen rightly states, the true challenge for UK housebuilding a lack of available land for building. Evolved materials, processes, labour and supply chains all play their part, but I would encourage housebuilders of all stripes to campaign for greater deregulation of the land. Once that's handled, all sorts of good things become possible.